The knowledge of the heart is in no book and is not to be found in the mouth of any teacher, but grows out of you like the green seed from the dark earth. Deep in the dead part of the medulla lies a forest so dark and so thick that rivers flow vertically and life is connected to all that is below. “Kid” begins her journey by wanting a heart that was never hers to have and falls into the underworld of desire known as The Dead of Winter Forest. On her way to downtown she is taught the fine art of discrimination and doing things the “correct” way. She discovers a spark of light in the darkness of her being as she drowns forever in the River of Blood. The Dead of Winter Forest became apparent in 1989 during my transgression into the underworld. Each night for almost two years I found myself with a host of demons and wizards who taught me the art of magic in a dark forbidding world. I wrote down everything I saw, felt, touched, ate, and anything that came with instructions. Wrote it all down even though I did not understand any of it. You are going through what the Greeks went through my therapist said to me as he pulled me aside one night after group therapy. I had just physically witnessed the Mother Beast in some sort of wild psychic empty chair trance. I was holding on to my sanity by a sliver of a thread; I had no idea what he was talking about. But his words sunk in and became my anchor for this new foundation. I rationalized that if others had gone through this experience, yes, the Greeks I said over and over to myself, then I could possibly survive this. It motivated me to really do the work. It gave me the courage to be part of the movie that played out every night. 10 years later, after emerging out from the darkness and living in the light of the Sun I began to research what had happened to me. This was pre-internet days so I was hungry for any book that dealt with the combined female/male dark energy since the Mother Beast was the first part of my puzzle. I combed through libraries and used-book stores. There was very little information but each book became my feast as I devoured every word and every idea to see how it related to my experience. I talked to as many therapists that I could find hoping someone could possibly shed some light on my experience or if they had encountered this experience with their patients. Most of them said no and thought I was brave to tackle the subject matter. The Emerald Tablet led me to Alchemy. Alchemy lead me to Cabala. Cabala lead me to Astrology. In 2009, while in meditation, I heard to go take a class at the Marsh with David Ford. That Sunday I showed up and when asked why I was there I said I was a singer and wanted to talk about my experience in the Realm of the Dead. But where to begin? David told me to go home and write. I wrote from the realm of trance and continued to research as astrology lead me to numerology. I would show up at class every Sunday with garbled words and tears. I knew I was saying something but everyone else felt helpless as they watched me struggle with the words. One woman even belted out her anger with me as she really tried to understand what the heck I was doing. David quickly spoke up and said I was inventing a new language and said that I needed this time to learn it myself. I felt like a alien trying to speak from across the universe. Numerology lead me to the Tarot. Four weeks later as I laid out the cards across my bed I blinked my eyes and my story began to play through the Major Arcana cards. The characters came to life through the symbols and images. There was MudDreds (High Priestess), Flyver (Empress) and my favorite character of all, Driver (Emperor). They showed me how to use my cutter the correct way (swords), helped placed me with my boat (chariot) and flew overhead, singing, as I was recognized by the new Owner (judgement) within my new magical authoritative body. It was fascinating. I returned to class with my first rough draft. Over the years I have performed every chapter except for the last. It unfolds in me every day as more information comes in. I am in the process of creating a set of Tarot Cards and writing a book. My future plans include a screenplay, video and film. 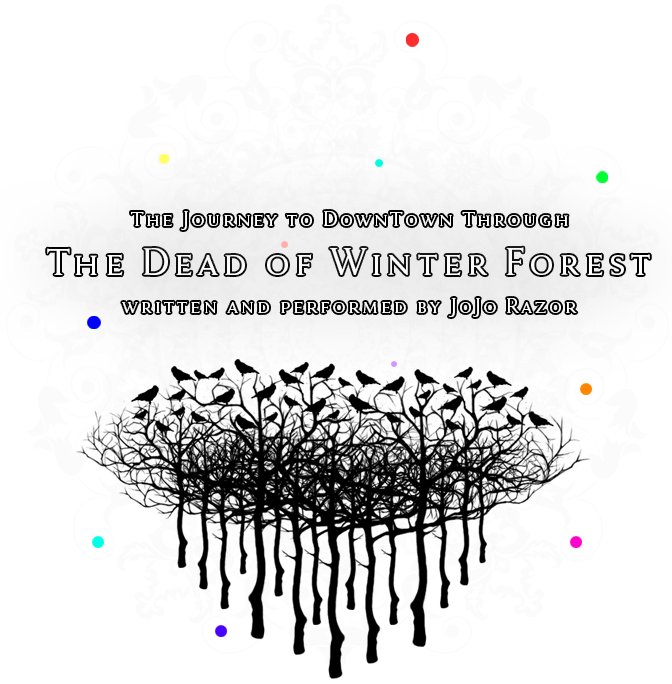 The Dead of Winter Forest, is a solo performance play about a contemporary tale of a woman’s journey into the surreal psychic realm of the underworld. It is a victimless world filled with thrill seekers, lawlessness, enchantment and transformation. Over the years JoJo has performed excerpts at the Marsh in San Francisco and Berkeley, California using storytelling, music, visual arts, film and ritual.